I’ve been meaning to make this pattern for while now as I have seen some great versions on other blogs – It’s not one that immediately appealed – who wants bulk in the hip area! But there is some voodoo magic going on here and with the close fit of the bodice, the overall shape is very attractive and I think suitable for everyone. I had an idea that I would use a structured fabric to make it more a formal number. I also like this pattern because equally I could make this in a cotton print as a casual dress with perhaps some side seam pockets. On this one I wanted to incorporate a full lining so I settled on this crisp blue grosgrain which shimmers and rustles on movement. I like this idea when the dress is plain, without embellishment or pattern that there be some interest in the texture of the fabric and this fulfills the brief. With the bodice I used the feature of the grosgrain and inserted the front panel and centre back with the grain going crosswise and with the side panels, sleeves and skirt with the grain running lengthwise, its a subtle feature but with the shading when the light hits adds something of a design element. As with all makes I drafted this first as a toile as the bust section is quite important and has to be right – with some re-drafting, not quite a FBA (Full Bust Adjustment), I opened the seam on the side panels – I did not move the seam to hit the apex of the bust as I liked the look of the bodice as is, I only needed to re design and extend the curve of the side/bust seam. 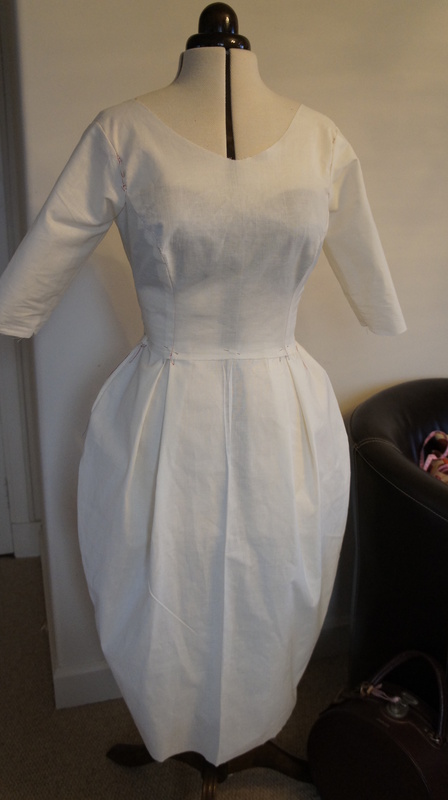 I also added an inch to the bodice length as in the toile it was sitting a touch too high on the waist. I also shortened the shoulders and re aligned to sit properly at the shoulder head. 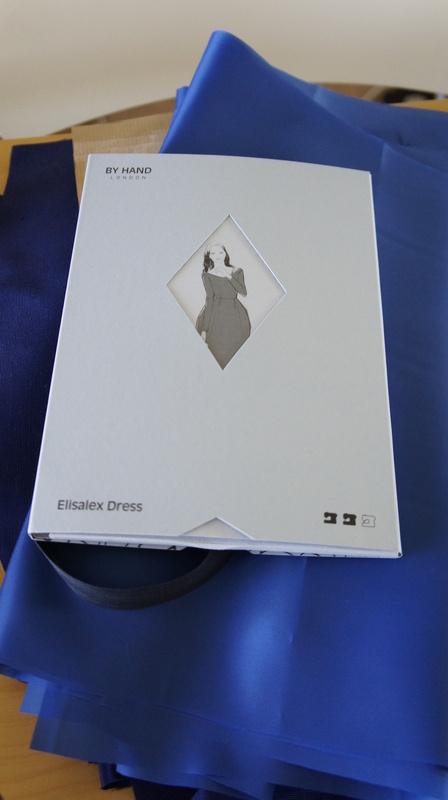 I will attach a couple of bra strap carriers as the shoulder line front and back is a feature of the dress and would be ruined by a wandering bra strap. The other alterations that I did were to have the sleeves finish slightly longer as I don’t like it when sleeves finish right on the elbow and of course I had to consider the poofie-ness of the skirt. After much deliberation I decided to take a couple of inches off the side seams at the hip area only. I know the width of the skirt is a particular feature of this dress but I had to consider scale. I am only 5ft 3″ and there was a serious chance of the dress wearing me and I think I would have been a bit self concious. 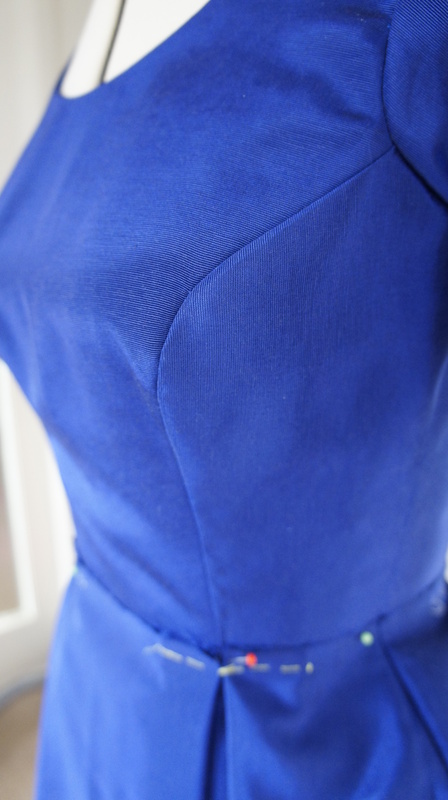 I also had to cut a chunk off the hem – consideration has to be made for in the hem when turning up as the narrowing of the hemline means you have to graduate back out for a turning. This you will have to determine at the cutting stage. Therefore a toile is a must. Inserting a full lining was straight forward although the pattern calls for a lining on the bodice only and to be honest with the skirt being so full a lining is not really required in the skirt as there is no chance of cling but I think on formal wear like this its a necessity as it prolongs the life of expensive fabric. I used a viscose lining on the bodice and an anti static lining on the skirt and I have to say it feels lovely on. Also the pattern instructions call for the same amount of fabric for cutting out for all sizes, as a result I had quite a bit left over, which I have since roll hemmed and made it into a stole. I am currently on the look out for some glass beading to finish the edges and to break up the sea of blue. I am also toying with the idea of covering the stole in a luxury fur with the fabric on the inside, which could be kinda spectacular! what do you think? What a gorgeous colour. I love the shape of this dress. It’s perfect. Thanks Tia Dia, yes it turned out better than expected, I just need to find somewhere to go with it! Wow-Wee… looks amazing on you. And a matching stole is a stroke of genius. Thanks, Yes I am really keen on the fur stole, but that’s just the diva in me – not sure how practical it would be – I don’t go to movie premiers – much! So very, very glamorous and chic. That colour is simply stunning! Thank you – yes the colour is very good, couldn’t resist. Oh you have pushed me too far Ma’am! Now I must cut out mine for fall. You look killer!! 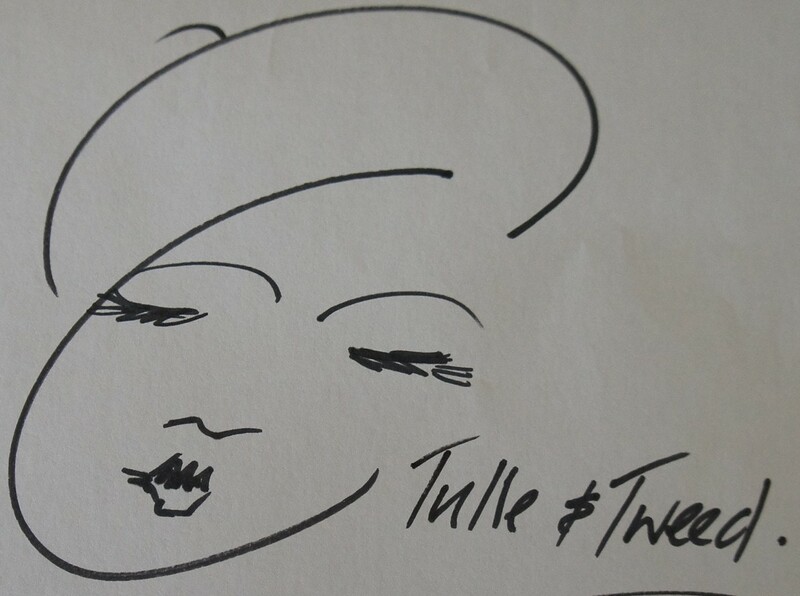 Thanks Anne, Oh so glad to have inspired you – I shall eagerly await your rendition – I have to say I think this design will suit you perfectly. Is it weird that I am excited at the prospect?! The By Hand girls have done a tut for side seam pockets for this one which you may find useful as I know you will want to utilise the roomie-ness of the skirt for the stashing of some doggie treats and the like. The colour & cut is magic-amazing job. Your review is also most appreciated, one I would refer back too should I make this dress in the future. Thank you. Thank you I am so pleased to be of help. Gorgeous. I did not know bra strap carriers existed, thanks for enlightening me. Thanks, appreciated. Yes the little bra strap carriers are quite common in vintage gowns etc. I will do a wee tut on these as they are very usefull and there are a couple of ways to do them. The wandering bra or slip strap was a particular bug -bear of my mother, in her eyes it immediately rendered even the most sophisticated a slattern! This made me laugh. My mother is the same as yours. In fact she has a stash of the purchased ones – a small safety pin with a black or white satin ribbon with tiny press studs at the end. If she ever saw a strap she would present the carriers to the offender. I have some sleeveless vintage American blouses that have permanent ones sewn in beautifully. But its always funny if you try to rip off your blouse or dress and find yourself attached by the bra strap…..
Gorgeous colour of blue and your look so good in it. Fab make. 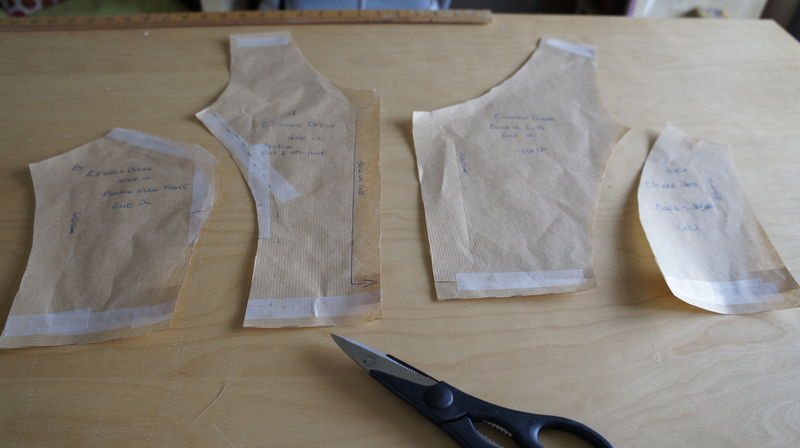 I’ve heard many sewers say they add 1″ to the bodices of By Hand dresses. I’m half way through a Georgia at the moment. Thank you. I wasn’t aware of the short bodice on the By Hand dresses, thanks for letting me know. I have made the Flora for my daughter but she is only 5ft so its not evident on that one, but I intend to utilise both patterns when I tutor sewing so its good to have the heads up. Good luck with the Georgia, I look forward to seeing it. Lovely result, that blue grosgrain is stunning. Faux fur on the stole sounds a fab idea, the cherry on top…go for it! Gorgeous and inspiring – you and the dress. I’ve always been such a pants gal, but this makes me think I need to sew myself a fabulous dress like this. You must feel wonderful in it! A list of bars, cafes, restaurants and hotels in Glasgow that allow [well behaved] dogs inside.